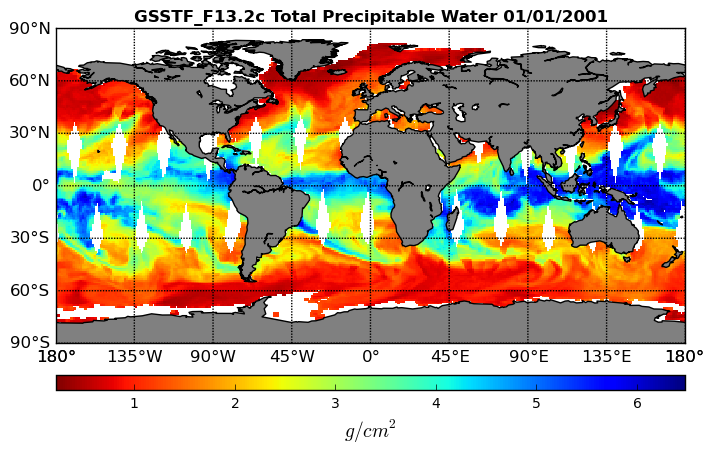 These data are part of the Goddard Satellite-based Surface Turbulent Fluxes Version-2c (GSSTF 2c) Dataset recently produced through a MEaSURES funded project led by Dr. Chung-Lin Shie (UMBC/GEST, NASA/GSFC), converted to HDF-EOS5 format. The stewardship of this HDF-EOS5 dataset is part of the MEaSUREs project. This is a Daily (24-hour) product; data are projected to equidistant Grid that covers the globe at 1x1 degree cell size, resulting in data arrays of 360x180 size. A finer resolution, 0.25 deg, of this product has been released as Version 3. The daily fluxes are produced for each individual available SSM/I satellite tapes (e.g., F08, F10, F11, F13, F14 and F15), and then serve as input to the Combined daily fluxes (GSSTF_2c). The short name for this dataset is GSSTF_F13.